I have been watching the trading arena with a lot of interest this week. I have shared with you my thoughts quite a bit on Twitter this week and I was expecting to see a couple of trades. Fortunately, I did manage to take a position in both. The first trade was in USDJPY and here you can see a link to when I posted it on my Twitter page. The second analysis was again posted the same day on my Twitter page. 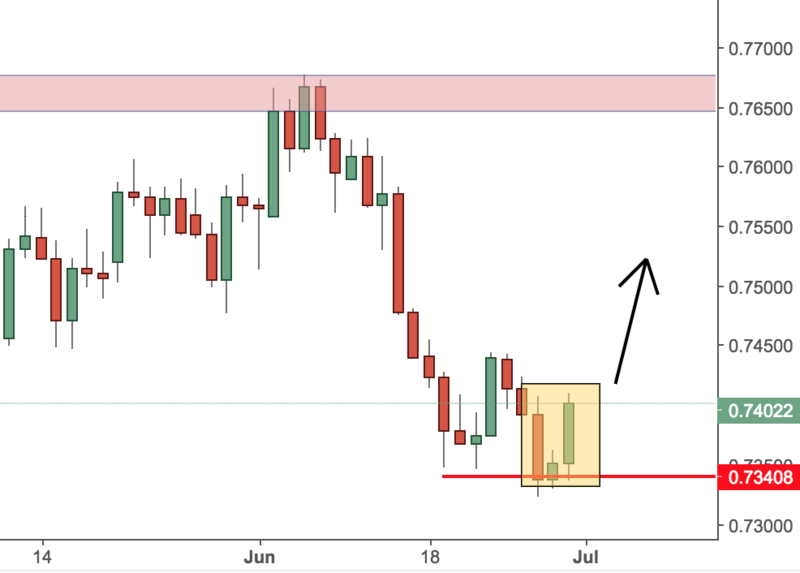 I was talking about the USDCAD and a double rejection on the daily and 4H timeframes. Since I shared it with you, the price has fallen a lot and is reaching for the next support level. Today, I am looking at the AUDUSD. There is a bullish engulfing pattern on a major support level. You need to be careful with this one, since the major trend is bearish. Even with this in mind, I still believe that price action is much more bullish than bearish. I will check how price will act tomorrow and possibly take a small long position. As the trend is established down, to me it would make sense to wait for a confirmation from a weekly chart. It seems weekly turning points marked by inside bars and some consolidation are tell tale signs of past turning points, lately there have been 2 weeks of bearish rejection but not enough of a concrete thing for that special entry.